Effect freeze will have on veterans: Anytime there is a federal hiring freeze it will have a disproportionate effect on veterans. But McAuliffe said that veterans can find work in the private sector in Virginia. Come to Virginia, he said, calling it the best state for veterans. State has passed legislation to help vets find work and to obtain professional credentials based on their military experience and training. McAuliffe: We have an aging federal workforce, same in state government. The hiring freeze sends a message to young workers that there isn't long-term job security in public service and those workers will look elsewhere, to tech companies like Google, Apple or Microsoft. Turning to immigration, McAuliffe criticizes Trump's priorities he'd spend $20 billion to build a wall along the border while freezing the federal workforce. McAuliffe calls Trump's pledge to build a wall along the border a "campaign stunt." "It's not an immigration plan." You pledged to preserve 400,000 acres of land in Virginia during your administration. You are way behind. What are you doing to accomplish this? When is VA going to get rid of the very regressive sales taxes on grocery food? Surrounding DC, MD, or WV don't have taxes. @GovernorVA @WTOP Will you veto HB 1578? @GovernorVA @vademocrats @WTOP #AskThe What is your advice to Virginian's who feel helpless w/ the negative actions our President is taking? @WTOP #askthe #askthegovernor @TerryMcAuliffe the silence and gag orders from POTUS are alarming. What can we as citizens do? On to sequestration. McAuliffe spoke with Speaker Paul Ryan today, who said that the federal spending cuts associated with sequestration would "come off the table." McAuliffe is talking about the need to diversify the state's economy, changing public education so students graduate with the skills to fill open technology and science jobs. He said Virginia would welcome an increase in federal defense spending, but the state still can't rely on that sector. Says that defense contractors still aren't hiring because they want to know where the federal budget is going, need stability. McAuliffe says the state's economy is improving, jobs are being created. "We can't take our foot off the gas." Says a major corporation will announce next week that it will move its headquarters from California to Virginia. 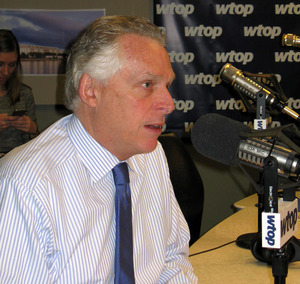 On to mental health: McAuliffe said the state needs more beds for mental health treatment. On the heroin crisis: Putting people in jail is not the answer, they need treatment. Mentions access to narcane, which can reverse an overdose, is also critical to addressing opioid addiction. He said the problem is just as great in Fairfax County as it is in Southwest Virginia and the Hampton Roads area. On to McAuliffe's proposal to stop suspending the licenses of people who haven't paid their court costs and fines from non-driving offenses. If you take away their license, you take away their ability to work, especially in the state's rural areas where there is limited or no public transportation, and you take away their ability to pay the court fines. "We do not want to discourage people from working." McAuliffe on a new Redskins stadium: You want to win the Super Bowl? Move the team to Virginia. Would creating higher paying job opertunities for people with felony backgrounds help the overall economy. How can the Trump Admin justify a Fed. freeze but now want to spend BUKO bucks on investigating a non existence voter I.D. fraud? What can we do to get him to stop this and stop wasting money when he promised to do away with unnecessary spending? An hour isn't long enough. Can you please stay longer especially when so many people are feeling they don't have a voice or no where else to turn? McAuliffe says he can work with the president on infrastructure and criminal justice reform. But he's wary about Trump's trade proposals. He said that China is already striking deals with the countries that would have been part of the Trans-Pacific Partnership. "We'll be left out." "We can't just trade and sell our products to ourselves, it is a global market." @WTOP what is the future for us Vdot workers? @WTOP will he sign bill for enhanced, mandatory sentencing for drug dealers whose products are proven to have killed their customer? @WTOP @GovernorVA no more taxes. no raises for over bloated state workers. cut spending. I applaud you for your work towards the criminal justice system. It indeed needs to be overhauled. I have contacted your office several times. I would like the opportunity to work with you and your staff with the drug crisis. This is personal to me as I have a son in prison because of drug addiction. People don't know where to turn for help and the help is so expensive those who are addicted feel there is no hope. Also, for those who are doing well, any hope of returning to Virginia parole? That's it for today. Thanks to everyone for joining us and for the great questions. We'll post the audio shortly and a story will follow.